Two years ago Morag and I went on a whisky tasting tour with Rabbie's to visit a few of Speyside's distilleries. Now, this August we left the smooth and sweeter whiskies aside, and instead we headed over to Islay. Again with Rabbie's. Our train up to Edinburgh was nothing special, except that East Coast has now been replaced with Virgin Trains East Coast. No real changes, except for the name. This time however, we got into Edinburgh just as the Fringe was starting. And that made staying in Edinburgh quite a bit more expensive. We thought to be clever and book a hotel near Rabbie's pick-up point, but I had failed to realise that they actually moved it—right next to the hotel we stayed in last time. The afternoon before the tour started, we had some free time in Edinburgh. We promptly headed to BrewDog's pub to have a beer and play some connect-four, before we headed to The Edinburgh Larder for a nice meal. On the way back, we caught the last sun rays hitting Edinburgh Castle. The next morning we got up quite early, had some breakfast at the hotel and headed towards our pick up point at Rabbie's Cafe. With a tour like this, it is always a bit of a guess on what sort of group you get. This time, we were touring with two Swiss, two Slovenians, three Indians, three Canadians, a very loud Australian, and our tour guide, Doug. On the way to Islay we also picked up two Japanese in Glasgow. 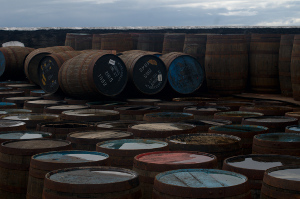 On the previous tour, we had a few people that didn't like whisky, but this time one of the Canadians was actually allergic to whisky (and beer). It is quite a trip to Islay, but luckily we stopped at many places on the way there. The first stop was at Luss, in the Loch Lomond and The Trossachs National Park. From there on, we travelled to Islay with a stop at The Rest and Be Thankful on the A83. 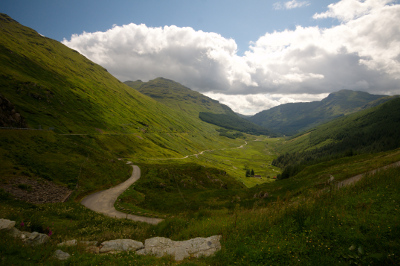 The slightly funny name comes from the time where you had armies going down the Glen and having to climb up to the pass. They could only rest when they got to the top — and clearly they were thankful for that! For lunch we stopped at the Royal Burgh Cafe in Inveraray. I had to try one of my favourite Scottish dishes, Cullen Skink, a thick soup made of smoked haddock, potatoes and onions. Inveraray itself is a small town on the coast of Loch Fyne. It has a pretty nice castle for which we didn't have time, and apparently an old jail that you can visit. After lunch we drove for a fair bit and stopped for a quick pint in Kilmartin at the Kilmartin Hotel across from the parish church, before having a good look at a set of standing stones. After another short drive, we took some time to walk up Dunadd, a hillfort and suspected capital of the ancient kingdom of Dál Riata. We had some spare time in the morning, as we were only going to be picked up at 09:30. That meant we had some time to run in the morning. There are not many paths around Bowmore, but I had scouted a nice route up to a local hill, and back. I ran quite a bit slower, as clearly it was hillier than my normal runs alongside the canal. After the morning run, shower and breakfast we were picked up for our first distillery visit. 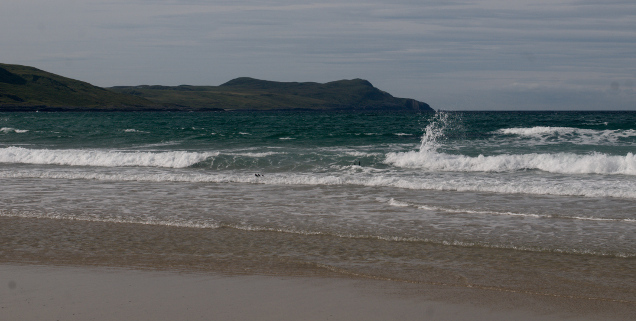 But before we started the tour and tasting at Kilchoman we spend some time relaxing on the beach at Machir Bay. After getting our "fresh nose", we headed to the distillery. We also sampled their Bramble Liqueur as an alternative tipple. After lunch we popped by Bruichladdich for a quick tasting. They are also fairly new, but quite less traditional than most of the other distilleries. They call themselves "progressive". Of course, Bruichladdich is responsible for getting me into whisky in the first place, as they sponsored an evening event at WhiskyWeb many years ago. As I already tried an Octomore 06.3 and the Classic Laddie 10, I also managed to get a wee dram of a Valinch, of which I did buy a bottle. We also had a sip of the Botanist gin. On our way back to Bowmore, we stopped at Islay House Square to visit the Islay Ales brewery. We picked up some local beers to take home with us. Bowmore 10 Tempest: A little hint of banana, but only after a drop of water. After the last tasting we dropped by the local Spar, which has a wall full of whisky. I guess that's why "Spar" was tagged onto the big sign saying "The Islay Whisky Shop". We bought a Classic Laddie 10 to share with the group. Some of it made it home. For dinner we had booked at the Bowmore Hotel. The food was good, and there was plenty of it. Actually, there was so much that we went straight to bed afterwards, without another dram! We had to get up a little bit earlier today for our pick-up, and slightly longer drive for our visit to the Whisky Coast. But first, a stop at the Kildalton Cross and church, for some history. 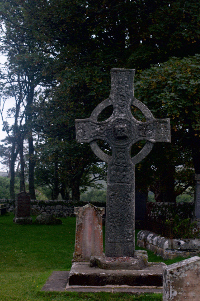 The Kildalton Cross is a Celtic cross over 1200 years old. The weather was rather gloomy though, and there was a bit of rain. We were quite happy to get back on the bus and head back towards the Whisky Coast. On the way there we saw two peacocks on a fence. Lagavulin 16: Their standard bottling. Laphroaig 18: Clearly the best, but I don't remember much of the actual flavours! After all the tastings, we made a little side trip to walk up the old castle of Dunnyvaig, with lovely views over the bay and Lagavulin. 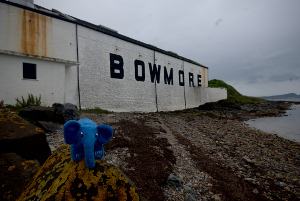 Back in Bowmore, we tried another run along the beach. But this was not such a great success as the pebbles were a bit too large to run on. We had booked at the Harbour Inn for our "date-night". A posh dinner looking out over Loch Indaal with the Sun setting. Before bed, we nipped into the Lochside Hotel for a last dram on Islay. On our last day, we had to get up early so that we could make the ferry out of Port Ellen back to the mainland. We were plenty of time for the ferry, so we stopped for a photo op at the old Port Ellen distillery and the Port Ellen maltings, where Diageo produces malted barley for most of Islay's distilleries. The ferry itself was uneventful, but extra tasty due to the availability of Bunnahabhain 12 on offer. The drive was quite long, with not much spare time. We stopped at Oban for an excellent lunch at Ee Usk and a quick trip to the Oban Distillery to taste a dram. We borrowed a tasting glass for the good reason to be able to taste a few extra drams on the bus back. We made another stop at the The Green Wellie Stop, after which we had to make a long detour because of some accident. We dropped off the Japanese at Balloch station, saw the battlefield at Bannockburn, The Kelpies, and the Forth Bridge. We arrived in Edinburgh just on time for our dinner at the Skerries restaurant at our hotel, The Dunstane. We finished the day with a last dram at their extensive whisky bar before retreating for the night, exhausted from another great trip to Scotland. You can find high-resolution and more photos on my Flickr set.